As I rolled out doughnuts for a recent BG post, it occurred to me that I could probably make bagels with the very versatile dough I was using. It turned out I was right. I made plain salt bagels and sesame bagels, but feel free to experiment with poppy seeds, cinnamon and raisins, onions, or whatever else you can fathom. Serve these with regular cream cheese or homemade yogurt cheese for a 100% do-it-yourself breakfast. Preheat the oven to 400 degrees F. Grease a large baking sheet with the vegetable oil. While water boils, prepare a floured surface for the dough. Cut the dough into 8 equal-sized pieces. Roll each piece into a 6-inch rope and connect the ends of the ropes so you have 8 smallish bagels. Carefully boil the bagels 2 or 3 a time for about a minute each or until they float. Transfer to a clean plate. Spread the sesame seeds on a dry plate. Dip 4 of the bagels (1 at a time) into the sesame seeds so the top is covered with seeds. Sprinkle the other half lightly with Kosher salt. Bake for 10-15 minutes until bagels are golden brown. Carefully turn bagels over and bake for an additional 5 minutes. Serve warm. Makes 8 small bagels. 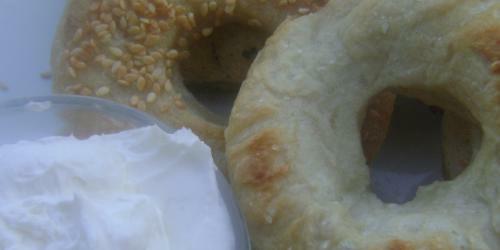 Pizza dough also makes for awesome pretzels, with very similar preparation. We experiemented with baking the pretzels covered in a variety of toppings, everything from Italian seasoning to garlic butter— Bagels never even occured to me! Yay Gabs! For anyone who doesn’t believe you can make great food on a budget, this should be proof! Love the creativity here — using the dough you had on hand to make something new. Those bagels look stellar! Just found your site and am a fan already! For anyone who doesn’t believe you can make great food on a budget, this should be proof! Love the creativity here — using the dough you had on hand to make something new.